Here is a photograph that was in the news during the Pope’s visit to the UK during September, 2010. It is commonly assumed that the man standing there with him is the Archbishop of Canterbury, ++Rowan Williams. I usually do nothing at all to change that perception, but in actual fact, ++ Rowan and I are doubles, and I could stand in for him and no one would know the difference at all. 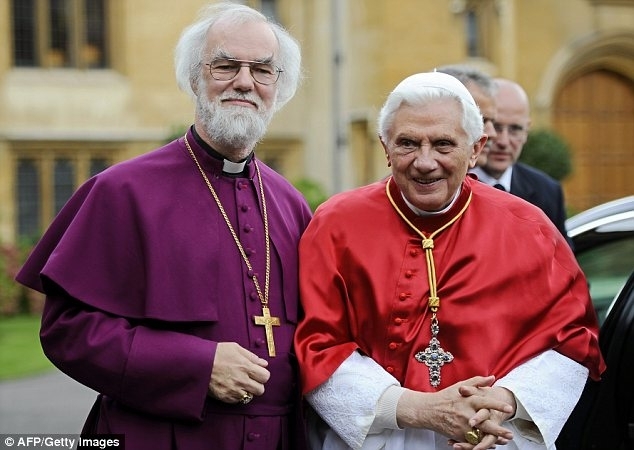 For all practical purposes then, we can take this as a photograph of Pope Benedict XVI and your scribe, who happens to be very much OUT of communion with ++ Rowan Williams. After seeing that picture, it probably will not surprise anyone if I tell you that I am an old man. I came to the priesthood late, after a long career as an academic and a practicing mechanical engineer. I held the position of Professor of Mechanical Engineering at several well known universities, and I also did engineering research for a wide variety of real work companies ranging from the watch industry, to the steel mills, diesel engine driven machinery, and lastly electric propulsion work for the US Navy. It was a long and varied career, all quite interesting. I enjoyed my work immensely, and never for a minute did I see anything that made me question my faith in God. The idea that increasing technical knowledge leads to loss of faith is completely bogus. In fact the opposite is true; the more you understand, the more clearly the hand of God becomes evident in Creation. Throughout most of my working life, I have had a sense of God calling me to come work for Him, but I could never see how to put it all together. I had family responsibilities (a wife and three children) that I had to support, and one of my children had some special needs that had to be taken into consideration. In short, I never did act on that call as long as I was employed full time. When I retired, however, then there was time, and it was definitely time to think about how to respond to this call. I was also getting much older, so spending several years in a conventional seminary course did not seem very attractive, although it would have been a wonderful way to prepare. Instead, I elected to “read for orders,” which means to study on my own under the guidance of a Continuing Anglican Bishop. I was fortunate to find a Bishop who was actively training a number of men for the ministry, and this helped greatly to get into an organized effort. I live in a small town that is not very receptive to Anglicanism (it is the seat of a Roman Catholic Archdiocese, and is 70+% RC) and consequently I have a very small parish. I would like to see the parish grow, but that is not a critical issue. This important thing is to have it here for any who want it. We will make our witness, and we will reach out to the world at large as well. This last is what the blog is all about. I just discovered your page and I love it. May the holy spirit strengthen you and the good work you do. Come again often. Have a blessed Easter!